We are a small family breeder in Minnesota raising mini and medium registered (ALCA) Multigenerational Australian labradoodles. They are raised in our home where the emphasis is health, individual puppy care, love and socialization. 2018 fall litter has arrived. Early Spring 2019 litter due. Follow us on Facebook at Rum River Labradoodles for updates or visit our website. IF YOU LIVE WITHIN 1 HOUR OF MINNEAPOLIS/ST. PAUL WE MAY HAVE A PUPPY AVAILABLE THROUGH OUR GUARDIAN HOME PROGRAM. Please visit our website for more information. Breeeders of family raised, well socialized, labradoodle puppies. Parents have all breed recommended health testing. Our dogs are part of our family and raised with our children. Puppies include health certificate, health guarantee, first vaccine, microchip, leash and collar, toy, bone, a bag of food, a puppy blanket that smells of siblings, a lifetime of breeder support, and a Granite State Labradoodle tote bag. We feature labradoodles, goldendoodles, labardor retrievers and Bernese mountain dogs. All dogs are health-checked, will have age appropriate vaccines, will be dewormed and ready to go home at 8 weeks of age. Our puppies are well socialized around children and other dogs. We are ethical and honest breeders. We love our dogs and puppies. We offer AKC Cream Golden Retrievers and Australian Shepherds and we offer Goldendoodles, Labradoodles, and Assiedoodles. We make sure they are fed a healthy diet, are well socialized, and in perfect health with all needed vaccinations. Raising dogs is not cheap and we do not cut any corners when it comes to our fur-babies. Spirit Labradors is located in South East Idaho . We are surrounded by world class trout fisheries and waterfowl havens. Sandwiched between the North ( Henry ’s Fork) and South Forks of the Snake River, we also have numerous small bodies of water as well. This Upper Snake River Plain area is primarily a farming community and has many huge grain fields. This added to the accessibility of wetlands attracts a wide variety and significant numbers of ducks and geese. Adjacent to us are miles of rolling sagebrush hills with good numbers of Sharptail and Sage Grouse. We also have many Blue Grouse and Gray (Hungarian) Partridge. Spirit Labradors is a small kennel and we may only have two or three litters of puppies each year. We hunt our dogs regularly throughout the season and they have the opportunity of retrieving many different species of waterfowl and upland birds. Our breeding philosophy does not include simply breeding for color (we may have Chocolate, Yellow, and Black Labrador puppies for sale). We believe that qualities of character such as drive, determination, and heart, coupled with a gentle disposition are more important. Any dog we have ever kept or bred must demonstrate three basic qualities: not only must he or she be an excellent hunter with very strong retrieving instincts, but must also be easily trainable as well as a good family pet. We believe that a quality Labrador is one that is pleasing to the eye – having classic Labrador good looks. We also believe in a year-round training program. We Hunt Test our dogs and train them regularly. We enjoy working with our dogs and believe that the “process” we go through is as important to our mental health as it is to the dog’s. Training is a family affair which we enjoy doing together. Bartlett Creek Labradoodles is the home of Premium American Labradoodles. We are located in both beautiful Northern California and Central Oregon. This is possible because although we raise doodles that are close to perfect we are not a kennel, but a boutique breeder. Our doodles are our children and they live in our home, roaming freely throughout our ranches and sleep with us too! Our goal is to bring to you a beautiful and smart labradoodle puppy to love and make a part of your family just as we have. 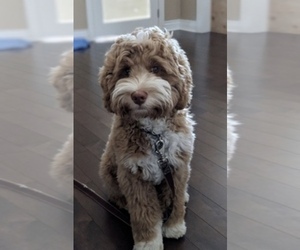 Looking for a reputable Labradoodle breeder in your area? Simply browse through our nationwide directory of 1000s reputable Labradoodle breeders - complete with website addresses, dog breed profiles, and current puppies for sale.